Styled with Black Design Strips. Understated grain markings and square edges add a modern twist to this traditional oak design. Bring the floor's copper hues into the limelight with understated styling and muted colours that contrast with the wood's brighter tones. An infusion of rich mahogany and clean copper grains that brings warmth into the home. 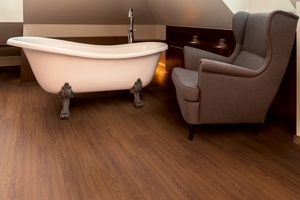 Oak Autumn wood-effect planks are rich in colour and elegant in style. This traditional vinyl flooring design includes a medley of mahogany and copper shades that combine to capture an enduring sense of warmth in the home. 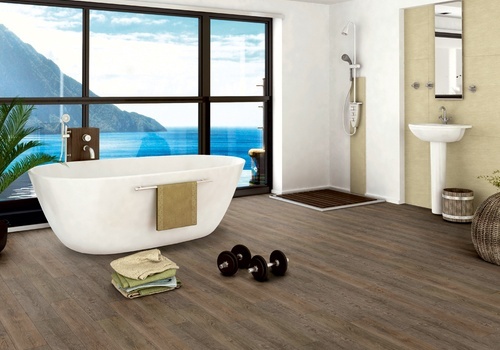 With a stain, scratch and water-resistant surface, Oak Autumn is perfect for bathroom flooring or any space where a higher level of practicality is desired. Order a free sample to get a feel for the floor’s authentic wood textures or visit your local stockist to see larger samples and get expert advice. Find your nearest stockist here. 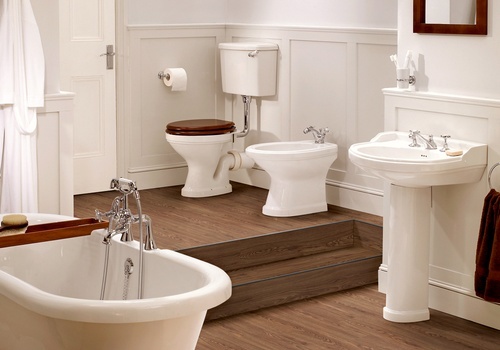 This classic porcelain design makes beautiful company for light and airy bathrooms with glossy fittings. 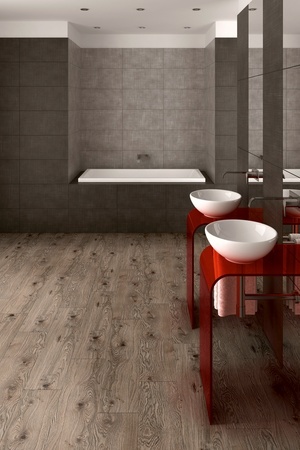 Style the floor with Black Design Strips to define each tile and capture the authentic look of grouting. 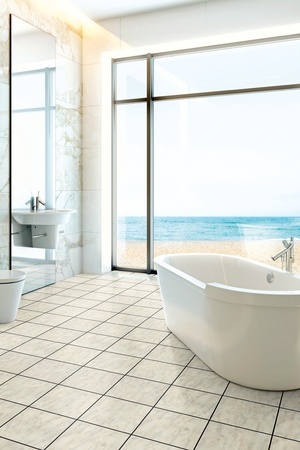 Bright white is pooled with subtle grey detail in these classic porcelain floor tiles. 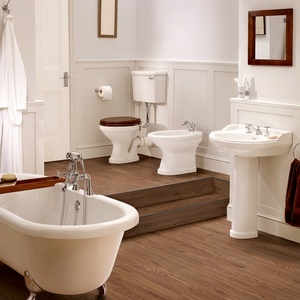 These classic white vinyl floor tiles make perfect company for light and airy bathrooms with glossy fittings. 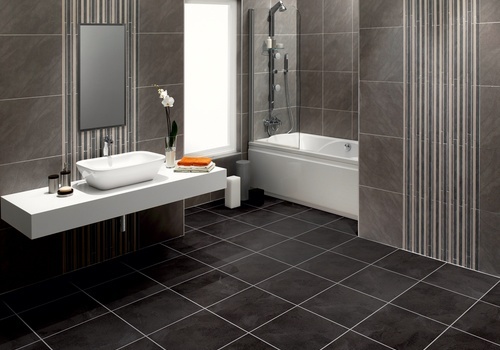 Style the design with black Design Strips to define each tile and capture the authentic look of grouting. 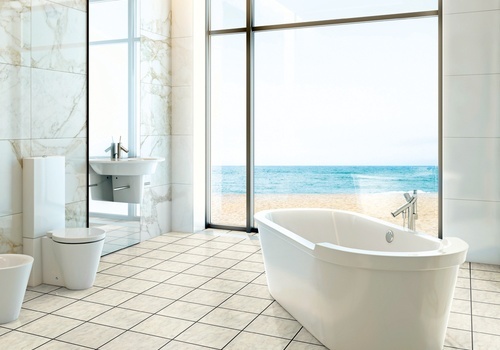 With a water, scratch and stain resistant coating, White Porcelain can meet the needs of even the most demanding bathrooms while feeling soft and warm underfoot all year round. 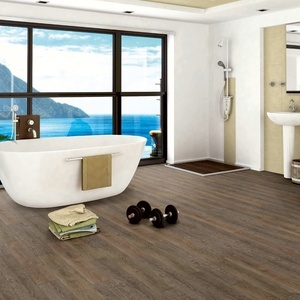 These vinyl floor tiles can be stuck down or fitted completely adhesive-free with our Vitesse magnetic underlay. Order a free sample to take a closer look or visit your nearest retailer to view larger swatches of this elegant design. This practical matte-black design is perfect for capturing powerful contrasts in your bathroom. Style with a monochrome colour scheme and define the tiles with white design strips to bring your floor into the limelight. Complete the look with minimal glossy white fittings and stainless steel. Clean, intense and unmistakeably statement. These practical matte-black vinyl floor tiles in a slate effect are perfect for creating powerful contrasts in your home. Style with a monochrome colour scheme and define each edge with White Design Strips to bring your floor into the limelight. Black Slate is built with a clever multi-layered construction that provides excellent durability and finished with a scratch-resistant and water-resistant coating to meet the needs of even the most demanding rooms in the home. Order a free sample of Black Slate vinyl floor tiles to get a closer look at the colour and texture of the floor. 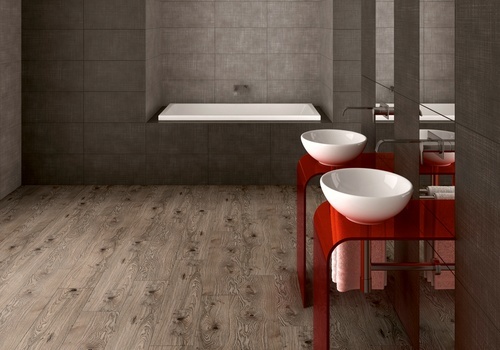 You can also view larger swatches of the design at your local Vusta showroom. Abundant with auburn, grey and chestnut hues, Sunbleached Spruce is a statement floor that never fails to catch the eye. Enhance the wood's lighter tones and inspire a tropical feel with citrus colours and touches of fresh green. An eclectic mix of ashen and copper shades combined in characterful stripes. Sunbleached Spruce is a statement design floor which fuses tawny brown, ashen and copper shades to create a truly distinctive weathered wood effect. The species’ unusual colour combination looks striking when paired with tropical colours and eclectic accessories. 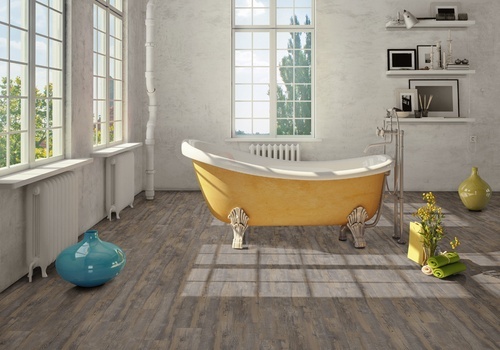 This eccentric vinyl flooring design has a multi-layered construction and water-resistant surface for outstanding reliability in even the most demanding rooms of the home, including bathrooms, kitchens and children’s bedrooms. 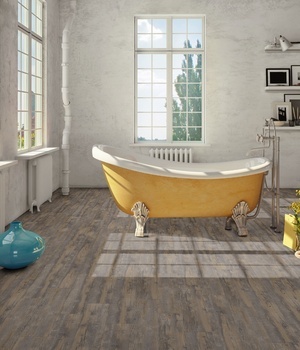 For a closer look at the colours and texture of this truly characterful floor, order a free sample.